Pictured at Lee’s Summit City hall on May 16 (L-R): Russ Berlin (board member), James Farquhar, Angela Holmes, Tanner Qualls, Kathryn Hilger, Lindsey Wendleton, Quinn Mosier, Mike Metheny (board member). Pictured at the Kauffman Center on May 25 (L-R): Russ Berlin, Isaiah Carter, Angela Holmes, Mike Metheny. May 28, 2014 — The Metheny Music Foundation of Lee’s Summit, MO recently presented its annual scholarships for 2014. 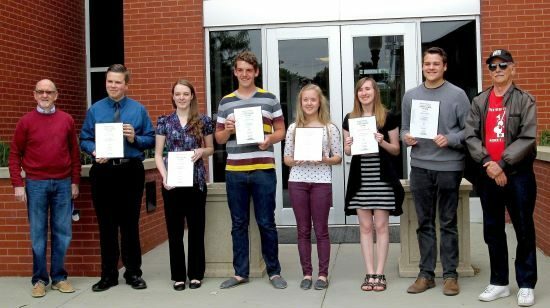 Included were awards for summer music studies (a program now in its 8th year), as well as the Foundation’s second annual “Knight Award” — named in honor of the late William R. and Lorene Metheny Knight — that provides financial assistance for a Lee’s Summit student planning to attend college as a music major. 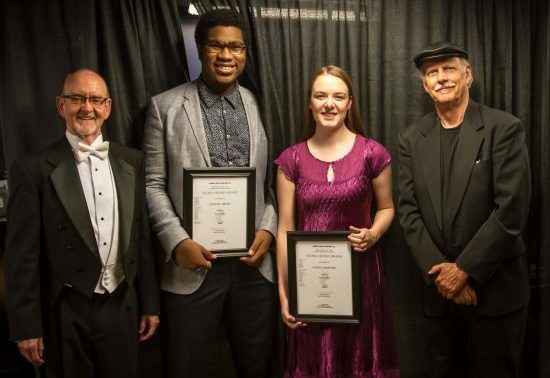 And on Sunday, May 25, as part of the Lee’s Summit Symphony Orchestra’s concert at the Kauffman Center for the Performing Arts, Isaiah Carter (drums) and Angela Holmes (cello) were introduced as co-winners of this year’s Knight Award. Music director of the LSSO, Russell E. Berlin, is also a board member of the Metheny Music Foundation. ©2019 Metheny Music Foundation. All rights reserved.